Blue purloined blanket and plaid purchased blanket. With the bitter cold weather, I am thinking about my Dad and one of his lessons to me. Always keep a blanket in the car during the winter months, especially when driving long distances. His insistence about blankets used to drive me crazy. My parents would come to Kansas to visit and not understand the Kansas winter mentality. Many people here do not wear winter coats most of the time. Since we have a ‘drive up to where you are going attitude’ in the suburbs. We really do not walk around that much. We get into our cars and drive to where we are going, then run in. So why wear a winter coat? A sweater is more than enough. I admit when I was younger, I would do the same thing. But I always kept my children bundled up. This attitude sometimes backfires on our children. My god son went from the Kansas City area to Madison, Wisconsin, for college. His mom suggested that he take long sleeve shirts and a winter coat up to college with him, his freshman year. No, he did not want any of that. Then came Thanksgiving break. His main request was a hat with ear flaps. He was so cold walking across campus. Winter coat, gloves, scarf and long sleeve shirts returned with him to Madison. My daughter went to college in New Jersey. She also was impacted by winter in this unexpected manner. Walking across campuses really is different than Kansas ‘run in and run out.’ Her request that first winter was a coat that covered her tush. I quickly agreed to that request. But back to my Dad. When my family was young, we often drove to and from St. Louis in the winter months. My husband’s family lived there. It made my parents nervous. So they purchased a plaid blanket for my car in case the car broke down. Having a blanket in the car was their idea of safety against the cold of winter. He also purchased a car emergency kit for me that had a first kit, jumper cables and a flash light. Even though that kit is long gone, I have made sure we always had one in every car. That makes sense to me. So I never argued about that. It was the blankets in the car that really drove him crazy. He wanted me to have a blanket for each person in the car. What would happen if we were stuck? We needed a way to keep warm. His passion became stronger after the time my husband, children and I got stuck in a snow storm on the way back from St. Louis. But we spent the night in Columbia…at a hotel… I told him. It did not matter. He was now truly concerned. I needed blankets, now! Dad would not use his. He would bring in to my house still wrapped in its plastic bag. It made me crazy. When he flew to visit in the winter time, he often would come off the plane with a blanket. When he got to my house, he would pull it out of his carryon bag and quietly place it in my car. I soon had a collection of blue blankets. During the winter, I kept a canvas bag filled with blankets in my car in case of emergency. Some purchased, some purloined. We had disagreement after disagreement as the blue blankets continued to enter my home. Finally my Mom had enough. “Don’t tell him not to bring you the blankets. The more you complain, the more he does it,” Mom demanded. She was right, once I stopped yelling at him and arguing, he stopped taking the blankets off the planes. Dad passed away in 2011. I no longer worry about the blankets in the car. Or so I thought. Oy, I feel my Dad’s spirit rising up in me! The plaid blanket my Dad purchased for me over 30 years ago is going into my son’s girlfriend’s car. My son will get the canvas bag filled with purloined blankets. When it is this cold, you do need a blanket in your car for long distance travel! As we enter the new year, I realized more and more that we do become our parents. My sister also has our Dad’s safety gene. She gave me a Vera Bradley blanket that folds into a pillow for Hanukkah. It is my new car blanket. Wishing everyone a safe, warm, and happy memory filled year! I Will Never, Ever Complain about New Jersey Drivers Again! It has only been five days that I have been in India, but I have made a decision. Next time I am back East visiting my family in New Jersey, I will not complain about New Jersey drivers and their lack of driving courtesy and their inability to drive! I will no longer complain about the honking of horns or being cut off as I try to merge. Living in the Midwest, in Kansas, for the past 30 years has spoiled me. Drivers are very polite where I live. If you enter a four-way stop, everyone stops and waits. They wave at each other in an effort to be polite. It used to drive my New Jersey Dad crazy. “What are they doing?” He would demand. “First person to the right goes first, why all this waving on! !” But that is the way it is. I am no longer used to New Jersey/New York traffic. When I go back East I only drive limited routes where I feel most comfortable. I will drive up to the Catskills. I can drive a bit about my sister’s town. But I hate the highways. 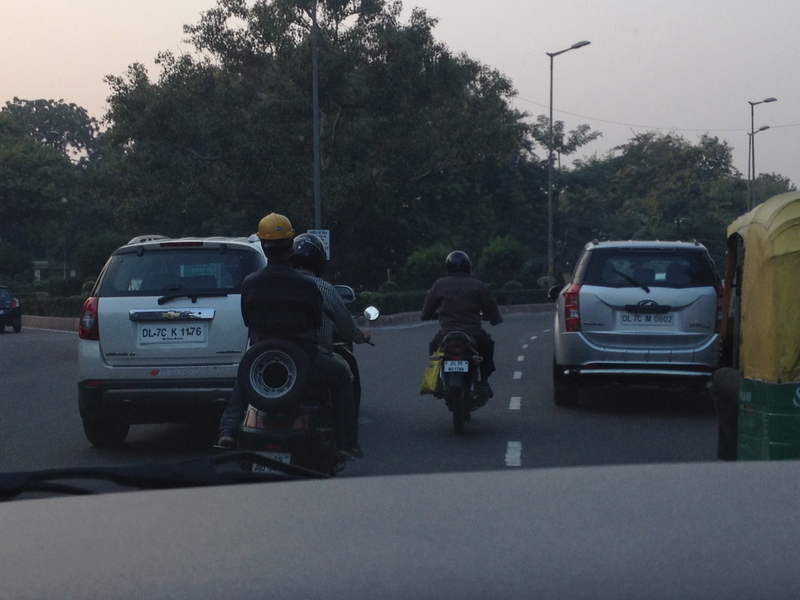 However, I now I have totally different vision about driving after being in cars in both Mumbai and Dehli, India. I get motion sickness, so my husband suggested I sit in the front seat. He told me first, “Think of it as entertainment!” That is one word for it. I did not get car sick, but oh my heart! There are no true lines in the streets. There are no true rules of driving. There is a balance, a ballet between the cars, trucks, motorcycles, bicycles and people who sort of share the roads. Although there are lines marking off two lanes, it means nothing. Often five to six cars and motorcycles share the road across. And a one-way street? Forget about it! I have seen cars and busses head the wrong way when they only had 30 to 50 yards to go! Why go the right way and follow traffic, when where you want to go is so close! Oh my goodness. My heart seemed to stop at times when cars were coming straight at us. There are also little green and yellow motorized rickshaws, that are an added attraction on India roads. They look like covered golf carts, but they only have three wheels. My husband tells me they have motorcycle engines. But these small open ‘taxis’ hold two people and can easily slip between the other cars. And I mean slip. The ballet continues as cars, motorcycles and rickshaws share the road and slip and slide between each other. A small open space gives anyone the chance to move forwards and around the other cars on the road. And they try. The motorcycles often have two riders…or three…or four: entire families riding together. Forget helmets in Mumbai. The driver sometimes wears them. But the wife and children do not. And the women ride side-saddle. How do they stay on? I have no idea. 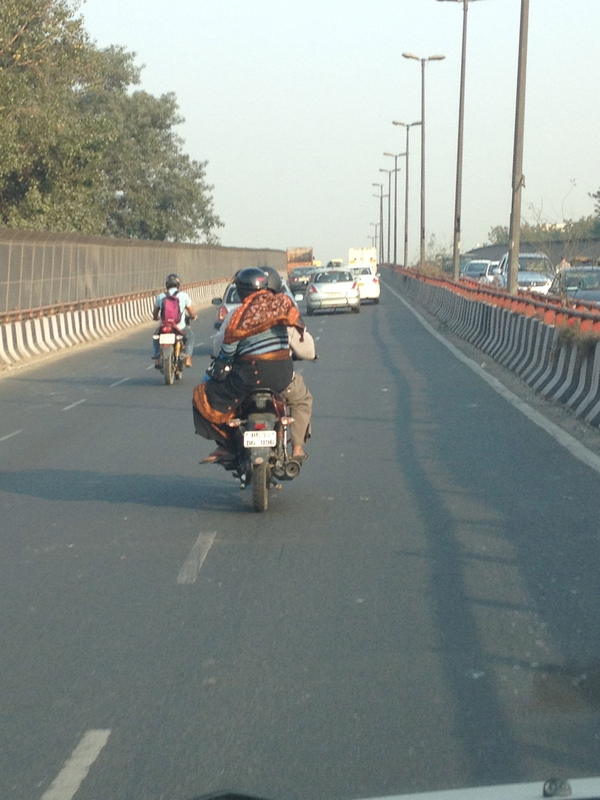 In Dehli many more people wear helmets, perhaps because the weather is much cooler? I am not sure. But watching the motorcycles zigzag through the traffic is a sight! The bicycles also join in the dance. A bicyclist can carry anything it seems. 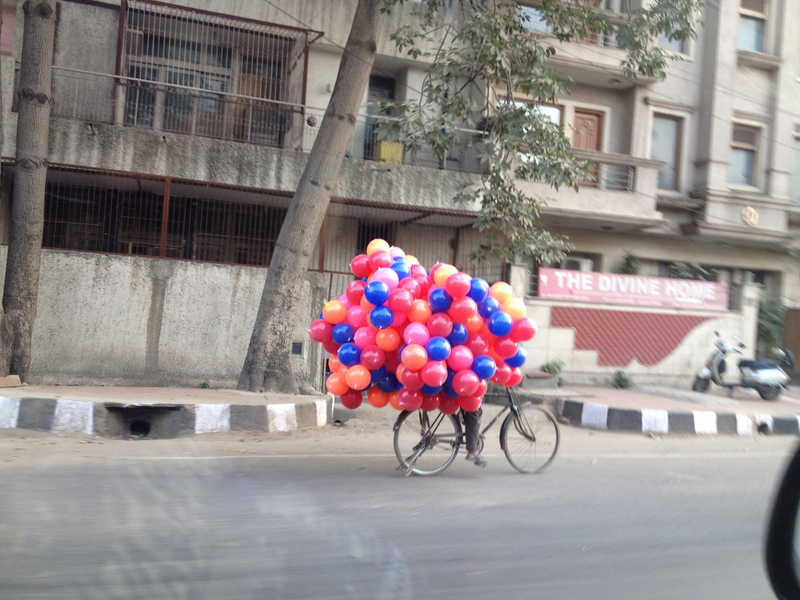 My favorite was the balloon bike. There were so many balloons all you could see what the rider’s feet. How he saw where he was going, I do not know. Perhaps the balloons would cushion any fall? Pedestrians seem to have no fear. They cross the street anywhere at anytime. Highway, who cares. If you want to cross the highway, just walk. In the middle of the street? Why not? The worst emotionally, however, are the beggars. Young girls and boys walking along stopped cars trying to sell something, or just knocking on the windows asking for money. It broke my heart to see a small child holding a baby and come and knock on the window where I sat. “Don’t give them money. It is not going to them,” the driver would say. I was told to get candy to give out or something for them to eat. I will look for something for the rest of my trip. And then there were the two small girls who started doing back flips and other feats between stopped cars during a red light in an effort to get money. They could not be older than 7 or 8. I was shocked. One stop light stayed red for four minutes. That was a major beggar domain. I l know we have poverty in the United States, but thank goodness we do not have children forced to knock on the windows of cars in busy traffic to try to get a few cents. The ballet of traffic has its own music as well, the horns. Each horn has a slightly different melody as they honk away to keep from hitting each other. And it works. People do not view the honking of horns as an annoyance, instead it is an important tool to avoid accidents. In all this driving for days, daytime and night time, I have only seen one small accident, or the end of an accident. Either a woman fell off a motorcycle, or was hit by one, but not badly. How do they all survive? There was only a few cars on the road that even had dents in them! Amazing. Maybe because with all the traffic you cannot drive quickly? All I know is that sitting in the front seat of a car or taxi being driven in India is a treat, and entertainment with its’ own rhythm. The choreography of cars, motorcycles, bike, trucks, taxis and people; the music of the horns; they come together for an almost unreal scene. We survived each trip so far. Only once did my friends and I really need a drink upon our return. One bottle of white wine was consumed as we celebrated surviving our journey through the streets of Dehli. “It was a near death experience,” one said. “I think I need a glass of wine,” I responded. “I think we need an entire bottle,” said the third. And we did. While we waited for the rest of the group we decompressed with a drink and a snack. And I hardly ever drink! No I will never, ever complain about New Jersey drivers again.